John A. Rauschkolb, Senior Chief Signalman, born Dec. 20, 1920. Joined the USN in June 1938 and was stationed at USNTS San Diego, CA; USS West Virginia (BB-48); Brazos; Relief; USNH Mare Island, CA; Rec. Ship San Francisco, CA; Raleigh (CL-7); US NAD, Oahu, T.H. ; Receiving Station, Pier 92, New York; USN PerSepCen Lido Beach, Long Island, NY. Discharged Sept. 1, 1977. He received the Good Conduct w/2 Silver Stars, Naval Reserve Meritorious, American Defense w/ star, American Campaign, Asiatic-Pacific w/2 stars, WWII Victory Medal, National Defense, Armed Forces Reserve and Naval Reserve. Married Beverley M. Furtado and they had two children, six grandchildren and five great-grandchildren. Beverley passed away Feb. 3, 1992. Worked for the US Postal Service and is now retired and living in San Rafael, CA. 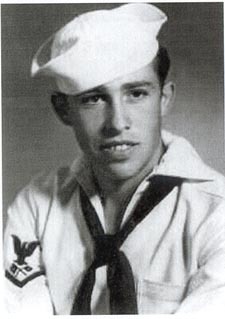 John Rauschkolb is a Pearl Harbor Survivor. He was mistakenly reported lost in action after the attack.